When logging into the admin area the first tab that shows is the Summary Tab. Here you can Create a New Event, click to Contact Us, or Click Web Support to view the online web help (more than likely it’s what you reading this on now). 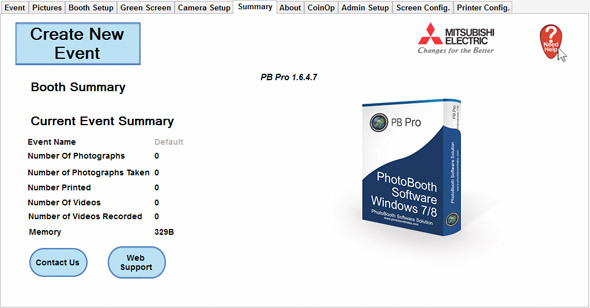 A few statistical bits of information are also shown about your system as well as the current Version number (Shown above as PB Pro 1.6.4.7). This may be useful to quote should you have any queries with the software.